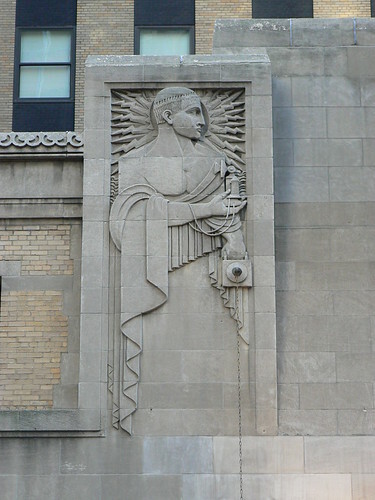 This is the third and final of my posts on the entrances to the Graybar Building along Lexington Avenue. This entrance is in the centre of the building and, I suppose, as the main entrance to the building it is different to the other two entrances. Firstly there is a flagpole sitting on an extrodinary black, gold and red support with a stylised eagle at the base of the flagstaff. The whole thing really stands out against the gray background of the building. This entrance is also flanked by two figures but while the figures on the other entrances look like gods or kings, these figures appear to represent the ordinary man. Again, like the other figures, they are richly detailled and each is holding an object but in this case we see modern objects. One man is holding a telephone. It is also interesting to note that each figure is holding something in their other hand which could be a lantern and these in turn are used to disguise the anchor points for chains that connect to the actual lights either side of the door. A nice way to hide some structural aspects of the decoration. This is absolutely stunning! Great post! Is this the most handsome building you have ever written about? What were the circumstances leading to the creation of this grand building. Thanks Sam, I agree wholeheartedly. I don't know if it is the most handsome building I have written about but I'll tell you what I like about it. Firstly, one of the entrances leads to Grand Central Terminal so literally millions of people go through those doors yet I wonder if many take any notice of this wonderful decoration. The other thing is that being in Lexington Avenue it is close to the Chrysler Building so I suspect that a lot of people are drawn to the Chrylser's wonderful silver crown and miss these gems at street-level on the opposite side. 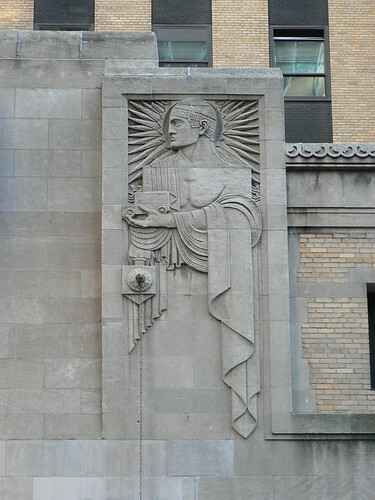 If you want to know a bit more about the origins of the Graybar Electric Co then there is an interesting comment by a former Graybar employee on The DeadProgrammer's Cafe blog, NYC Buildings You've Never Noticed : The Graybar Building and of course there is good old wikipedia. The Graybar Electric Co was established as the ditribution arm of Western Electric and took it's name from the founders of the original buisness that became Western Electric - Elisha Gray and Enos Barton. 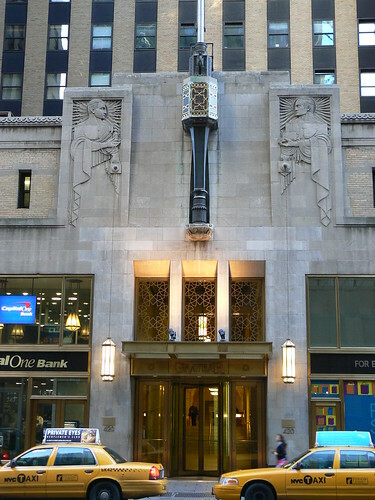 Graybar occupied the NYC building until 1982 and now has its HQ in St Louis, Missouri. Wow.. amazing, beautiful building, thanks for sharing !! It's a great building that can't be fully appreciated because of the limited perspective available on narrow Lexington Avenue. Your commentary is excellent. I've walked by there hundreds of times without ever noticing that the lamps are suspended from the reliefs! Thanks Moshe. Your comments are much appreciated.